Updated June 2014. Many items have been re-written. This article looks at Apps that address specific areas of need that some users with dyslexic difficulties encounter and highlights particularly useful features. Each item also links to the iTunes store (UK) where prices and information from the developer can be found. Apps cannot provide the range of facilities found within any fully functioning software used on a computer or laptop. However, some users have reported being able to gain sufficient support to maintain a mobile working environment by using a few carefully selected Apps and with specific features enabled on the device itself. If you have any helpful suggestions, comments or illustrations of use that you consider would be of interest to others, please send them to: bdatech@btinternet.com. There are now over one million Apps on the App Store alone, so it can be overwhelming when setting out to find those that suit the specific needs of a user. Other useful sources are also listed at the end of this article. These pages contribute to this growing information pool by highlighting particularly useful features in Apps, how these might support the needs of some users with dyslexic issues and, wherever possible, comments from users themselves. Yet not only is this this exploration an evolving one but the experience may not be universal: what suits one person may not suit another. Apps vary in design as well as the support tools and options they offer, but this is not always reflected in the price they command. Cost alone is not an indicator of quality or usefulness. There are some great Apps around that offer a range of significantly useful features for what is a relatively small price. Some Apps differ in the ease with which their end product e.g. document or image, can be exported or used in other applications. This process can feel cumbersome compared to the experience on a computer. Yet, as the quality of some Apps continue to improve with updates, this is becoming easier, making it possible to transfer or share documents with other Apps and across devices. However, the experience is not consistent. A suggestion would be to set up a Dropbox or Google Drive account to enable a document to be transferred and accessed across devices. Voice options for text to speech (the ability to hear the written text spoken) have also improved considerably in some Apps. The latest models of iPhones and iPads (or older versions updated to IOS 7) now offer Speak Selection. This provides some limited voice options, whilst purchased Apps offer further possibilities. However, it is important to note that text to speech does not work within every web page, document or e-book. This accessibility is dependent upon whether its original format has been protected (DRM: Digital Rights Management). This varies and is not consistent across different regions of the world. Some writing and book reading Apps now offer speech to text as part of the App itself and some of the newer voices suggest intonation. It is important to note, however, that these voices are not always included within the basic price of an App but obtained subsequently as an in-App purchase. Word prediction is also available in some writing Apps and may offer additional support to some users. The latest models of iPads and iPhones also provide the opportunity to use an inbuilt speech dictation facility if the device can access the Internet. This is achieved simply by tapping the microphone icon on the lower left hand side of the keyboard. It records for approximately 30 seconds. Some users have found this utility particularly useful. They also edit their text using the speech to text option (Speak). This has offered some individuals a chance to explore speech to text; a function that was once only ever available on a computer. Now they can access this on the small portable device they usually carry around with them. With all these choices now so readily available it is even more important that any selection of Apps considers the specific needs of the user, the task and the contexts in which these are to be used. 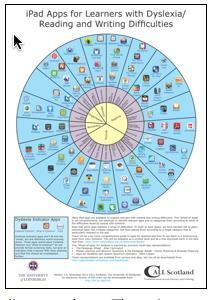 Some Apps offer access and support with reading, writing and organisational tools. They may also offer facilities that can quickly capture visual and auditory material. This may even encourage some users to try out assistive tools for the very first time. Some Apps offer the opportunity to try out particular features provided by full versions of software. This is especially useful when the cost or lack of trial versions of software has prohibited any earlier consideration or simply because (and I am finding this the case with some of the teenage students I work with); they can access similar tools upon a device that many of their peers also own and use; not a specialist piece of equipment. So: if some individuals are using smaller mobile devices more frequently, one additional feature to consider is the nature of the onscreen keyboard itself. If a quantity of text needs to be typed, then not everyone finds the onscreen keyboard the most efficient means of text entry. The length of document seems to be an important issue and some users have reported that they prefer to use physical keys such as those available within a portfolio type case on an inbuilt keyboard or carry a separate (Bluetooth) keyboard with them. Their illustrations of use demonstrate that every choice comes down to personal preference, need and the context in which any device is to be used; so individuals need to be able to explore what works best for them. A very simple way to achieve some basic text to speech support is to enable the inbuilt Speak Selection option. This can be used in some applications e.g. webpages, text documents and some e-books (N.B. not all). The text has to be highlighted each time and the Speak Selection option enabled within Settings. To activate: Go to Settings – General – Accessibility. Select Speak Selection (ON). Adjust the Voice, Speaking Rate and Highlight Words to suit personal preference. To use: Select a page with text. Tap the screen to highlight the text (drag the corners of the coloured highlighting). Now tap Speak. The illustration shows this feature enabled and used within iBooks. N.B. A separate accessibility feature, VoiceOver, is also available for those with low vision. This may provide a useful reading tool for some Apps when other text to speech options are unavailable. It is also activated through General – Accessibility.. Built in text to speech is now available on Android phones and tablets (Android 4.0 or later). For Android devices you will need to turn on text-to-speech. This is done through the Language settings menu. Although the voice provided is quite robotic there are a number of high-quality voices available for purchase on the Google Play store at a low cost (search for SVox, Ivona or CereProc). Once turned on, some apps will offer a speak selection option on selected text or you can install a text-to-speech app that will access the clipboard. Voice Dream Reader. 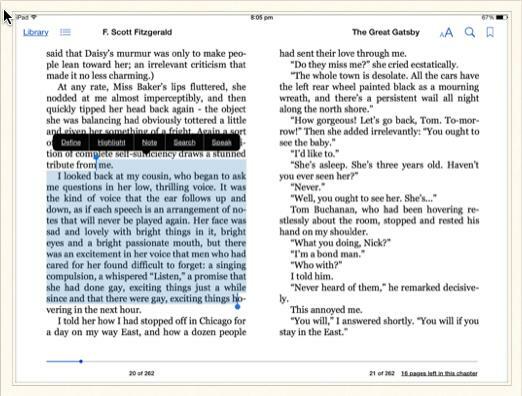 This App offers a wide range of text to speech options to support the reading of books and documents including PDF, ePub, Daisy, Word and Text files, Web pages saved in Reader or InstaPaper; as well as books obtained from Project Gutenberg or Bookshare. It provides excellent support for users with reading issues.. There are now 36 voices included in the initial purchase but a further range of quality Acapela, Ivona and NeoSpeech voices with regional accents and languages are available as an in App purchase. The voice speed option ranges from 150 to 700 words per minute and offers precise synchronized highlighting by word or line, eight fonts (including open dyslexic), adjustable line and character spacing, background and text colour options (see full details). Comments: There are many valuable features in this App – making it easy to customise for particular needs. It also provides a powerful support tool for study as the App includes note-taking, bookmarking, highlighting and search facilities. Pages are also accurately numbered in Daisy format. iBooks is Apple’s own eBook reading tool. Any compatible eBook or PDF can be opened. Books can be purchased through iTunes but there are also free books available. Some offer a Sample text to try. The pages turn like a book although they can also be set up to scroll. Some eBooks can be read aloud using the Speak selection function or through VoiceOver (but with no highlighting). Comments: The App offers a limited number of fonts and background colours: sepia, white or black. Line or word spacing cannot be adjusted, but the Speak Selection may offer sufficient support for some users who only require shorter pieces of text or the occasional word read aloud. A dictionary is available but the Speak option does not allow definitions to be heard. Kindle This is the App version of the Kindle. Books are purchased and downloaded through Amazon. The App offers a small selection of fonts but these can be adjusted in size. There are three background colours and the line spacing can also be widened. An additional dictionary can be downloaded to use within the App but the text within it cannot be spoken. Comments: Some users find that the note-taking facility, with highlighting options, makes this a useful study tool. However, the App does not offer the text to speech support available in the Kindle Fire. Speak Selection can only be used with some books. Blio An eBook reader for purchases from the Blio bookstore; includes audio, customised fonts, colour backgrounds and images. The App also allows access to freely available eBooks and EPUB, PDF, or XPS formats, via iTunes or the web. Comments: The sample book provides an example of audio with text highlighting. The default voice is American but other voices can be purchased. N.B. not all books use text to speech, but those that can are indicated with a green head set symbol. VoiceOver will read a PDF that reflows. However, this is not consistent and feedback has suggested that magnification is not good when using zoom. The quality of text read varies. ClaroPDF provides another useful study tool from Claro. It enables any PDF text to be spoken with good quality (Acapela) voices including synchronised text to speech. PDFs can be annotated with tools that permit highlighting, underlining, freehand drawing and text boxes. Files can be opened and saved using Dropbox and Google Drive. They can also be opened (with annotations) in any other App that supports PDF format. Different languages can also be supported with an additional in App purchase. Instapaper enables users to save and read web documents offline. It is installed as a bookmark. When browsing the web, tap the document to instantly save it into the App for later access. Items can be moved and saved into different folders. Eye Reader is an easy to use magnification and illumination tool using the LED and camera. The Zoom function allows the text to be increased. The light automatically comes on when the App is launched but it can be turned off by gently shaking the phone and dimmed or brightened by swiping with one finger. Comments: This is a really useful magnification tool. It now includes a save picture function and the length of time the light stays on can be adjusted within Settings. Adilko and Moon+ Reader Pro are both popular eBooks apps for Android. The latter supports text to speech. Kindle is also available for Android but again is not accessible with text to speech. Support for writing is one area where there has been a significant increase in the range of Apps on offer. Choice for these rests upon the type of functions required but also personal preference over the style in which these are displayed and accessed. However, it is becoming increasingly important to some users whether (and if) they can easily share the documents they create with other apps, across devices or link to the full version of software they use on a laptop or computer. In this section consistent quality in text to speech support has been one of the criteria required for selection because this provides a powerful editing tool for some users. ClaroSpeak is a good quality text to speech application offering voices with international accent(s), synchronised text highlighting and word prediction. The simple interface allows text to be read by word, word trail or sentence. A range of options exist for different fonts, text highlighting and background colour. Text can be exported directly into e-mail or messages and also uploaded directly into Dropbox or Google Drive or simply copied and pasted. This App differs from others in that any text can be saved as a speech file using the text to speech voice and there is an opportunity to purchase additional OCR scanning through an in app purchase. Comments: A very easy to use writing tool providing good support. Text files can be saved within the app. An option to create folders would be a useful addition. iReadWrite provides a powerful writing support tool with text to speech support, phonetic spell checker and word prediction. The display can be configured so that font style, size, colour and background colour can be adjusted for individual preference. The British version offers two voices – Daniel (male) and Serena (female). A notable difference offered by this App is the additional support for recognising homophones and easily confused words. Text to speech is also available within the dictionary and offers visual support for some words. Comments: This is another good writing support option; offering powerful features within a simple design. Again, there are no options to create folders for documents and although text can be imported from Dropbox; as yet there is no link to export it there. All text has to be mailed or copy and pasted elsewhere. iWordQ UK provides support for both reading and writing through two separate modes of presentation. Writing mode presents a text editor offering both word prediction (which can be configured for options e.g. “predict next words” as well as its position upon the screen) and text to speech (using the Acapela voices of Lucy and Graham). Default options on iOS devices, such as the dictionary, can also be accessed. The text is automatically saved and can then be directly exported and shared e.g. to Dropbox and other Apps upon the device. Three options are available in Reading Mode. These provide the ability to hear sentences individually, continuously or in a stepped approach. Comments: The three different ways to access speech support offers flexibility for individual preferences. The app also offers the facility to alter the pronunciation of words. Crick Software have now developed a range of Apps that offer different levels of writing support. Apps now include: WriteOnline and a suite of Clicker Apps (some discussed below) outlined by the developers within a useful comparison chart. Each App in the Clicker range offers some of the features and tools found in Clicker 6; each with text to speech and a grid making tool. Clicker Docs enables the construction of word grids that can be configured with the simple but powerful Grid construction tool (including options for background colour and design). Text can then be inserted into the word processor using either the grids or keyboard. Further support is provided through word prediction. Text can be highlighted as it is spoken and configured to speak either letter, word or sentence using three different speeds. These documents can then be emailed as .txt file, clicker document or pasted into email. Access is also available to the readymade grids from the LearningGrids site. Clicker Sentences is another useful app providing particularly useful early writing support for new or struggling writers. Clicker style grids provide opportunity for sentence modelling and writing. An image can be used within the cells on the grid from the iPad camera or from iPhotos. A variety of sentence modelling options allow text to be seen, heard and constructed. Text in grids can be spoken before writing and once it is has been entered upon the writing screen. It is also very easy to create a series of sentences into linked grids to support writing. Comments: This App suits younger users but although the text in cells on each grid can be heard; images cannot be inserted into the cell like users may be accustomed to if they have used Clicker6. Clicker Connect provides essential support for writers who are developing their skills. It also provides the step between Clicker Sentences and Clicker Docs. Again grids can be quickly created but this time the cells in each grid can be configured for words and phrases, with the added opportunity to include a picture. The App provides a bank of images but users can also use their own photos. As with all Clicker Apps; users can access a range of ready made grids from the Learning Grid site. ClaroCom UK is a talking word prediction tool with phrase banks. Although designed to aid communication; it could also be used for those who want a simple tool for drafting and checking emails and messages. Type into the message box with the help of the word prediction or select a phrase. Use the text to speech to hear the text in the message box. Hear text echoed as it is typed and set the fonts and colours throughout the app. Once complete export to mail, messages or copy to another app. ClaroCom comes with two UK voices and voices in other languages can be purchased. Speak it! A simple text to speech app where font size and speed can be adjusted. Additional voices be purchased for an additional fee. Text can be saved as an audio file and then emailed from within the application. Comments: N.B. Text needs to be copy and pasted into the Apps. It can be highlighted as it is spoken but the keyboard needs to be displayed for this to function. AppWriter English: a word processor designed (according to the developers) specifically for users with literacy difficulties. It incorporates highlighted text to speech (with web access), word prediction, font and background colour preferences. Comments: The App comes with a default dyslexie font but the spell checking may not offer sufficient support for all users. Abilipad combines the use of image, grids, word prediction and spelling support for writing. Comments: Again the spell checking feature may not offer sufficient support for all users. However, the ability to customize keyboards makes this a useful tool. A useful tutorial on using this App can be found at: Abilipad website. CapturaTalk for Android: a reading and writing support app for Android devices with a range of tools. CapturaTalk includes a talking web browser, word processor, pdf reader and ebook tool. It also has built in OCR which allows you take a photo and hear the text. aloud. Prices are ex VAT which dyslexic customers are exempt from. Customers can buy it pre-installed on Toshiba tablets and then the bundle is VAT exempt. The latest models of iPads and iPhones offer speech to text from the keyboard itself. This requires Internet connection and allows approximately 30 seconds of recording each time it is activated. Dragon Dictation is a speech to text application requiring web access to function. Text can be sent direct to sms, email, Facebook etc. or copy and pasted into other applications. Comments: This App is useful for short bursts of text rather than prolonged writing. Text to speech support is available (when the keyboard is visible) using the Speak Selection accessibility feature on the iPhone and iPad (see above). The following apps do not have inbuilt text to speech but the Speak function could be used for editing. The speech to text function on the keyboard (microphone symbol) of later devices could also be used. Pages. This app provides a byte-sized version of the Mac word processor. A range of templates are included, shapes, tables and photos can be imported with a tap and documents saved or exported. Comments: Documents can be directly exported to email, iTunes etc – but the option to export directly to other facilities such as Dropbox would be useful. As a word processor, it is an easy product to learn to use but does not have sufficient support options that some users may require. Evernote. A very easy to use web service that links notes from the computer and iPhone, iPad or Android device whether they are text, audio or images. Store them on one device and they will automatically update across others. Comments: Allows you to keep your jottings safe and organised into notebooks – they can be tagged and easily found again. Recordings can be made, photos taken and all can be shared via email – they are automatically dated and a location can be noted to help the memory. Penultimate: is useful for the production of handwritten notes, diagrams etc. These can be saved into individual notebooks and both can be sent direct by email, Dropbox and Evernote. There is a choice of width of pen, colours and ability to take photo within app. Comes with lined, squared and plain paper backgrounds but additional ones can be purchased including papers for musical notation, young writers and time management. Comments: an easy to use app which contributes to a collection of tools to improve productivity. Notability: provides an elegant note-taking facility that can be used to sketch, record and annotate using a keyboard, finger or stylus. Different formats of documents can be imported including pdf and can be linked to Dropbox and Google Drive. Skitch: (iPad and Android): a collaborative tool that allows you to capture screen shots, annotate and share. A simple but highly effective facility. Popplet provides a space to create and share ideas. Use the App to brainstorm thoughts, create a mindmap or simply annotate an image. For Android users: Popplet can be used via a web browser. Explain Everything (iPad and Android) offers a highly customizable interactive, easy to use whiteboard for a mobile device. Combine pictures, video clips and much more to create animated presentations and screencasts. These can be shared using the various tools such as Dropbox etc. Comments: a great tool that could be used in so many different ways. It is easy to create a series of pages, record a commentary and then publish the file as a screencast. Save a Keynote presentation as a PDF, drop it into the app and it is automatically set up as pages that can be quickly annotated including weblinks, and video clips. This is a great open ended App which could be used to create resources for students and for them to use themselves to demonstrate their understanding. SimpleMind+: A really easy to use mind mapping tool that allows the user to brainstorm and organise ideas simply but effectively. Comment: An excellent tool to introduce new users to planning writing effectively. Inspiration provides a byte-sized version of mind mapping software: export as an outline version or as a pdf of the map. Comments: If you are used to using Inspiration on a computer, this will feel limited, but it is still very useful. Although the map can be exported as a pdf, it cannot then be reassembled through the computer software version. Side by Side and Side by Side Pro permit the iPad screen to be split into two or four screens. Each screen allows for web browsing, viewing documents or files and or note taking. Notes can then be exported to other writing programs on your iPad, saved into Dropbox or emailed. Comment: paid version is advert free. MindMeister is an Internet based mind mapping service. A free subscription level allows you to save up to three maps. It is easy to share maps to enable one than one person to collaborate with you. Maps are also accessible via any web browser so this is a good tool if you need want to access your maps on lots of different computers. iDraw: a versatile drawing and painting package with many tools and options. OCR requires a quality image to scan, good lighting and a steady hand. The following are worth trying if mobile options are required. Prizmo offers a good scanning option for a mobile device plus text to speech feedback. ClaroSpeak also has the option to purchase OCR scanning as an additional in App purchase. Dragon Search (Free): Instead of typing in text when you want to search the Internet – just use speech (requires internet access). Google Search (Free): Just speak into this app to search the internet (requires internet access). Comment: this seems quicker than Opera and Safari browser searching. Dropbox and Google Drive provide a useful option for access to documents across devices. The Apps provide instant access to your documents wherever you have web access. Comment: Excellent options for back up as well as moving and using documents, images etc., between apps. Daily Reminders: A very simple notification pad for daily tasks. Comments: If you use Outlook or Calendar efficiently then this app may seem too basic for you. However, it is the simplicity that makes it a really useful tool for setting reminders for the tasks you need to do each day and one day ahead. PhotoMind is a notification app which uses image instead of text. Take a photo and set the time to be reminded. VoCal Voice Reminders: a notification app that uses voice or sound instead of text. Record, set the timer and decide if you need to be reminded every minute or hour until the task is completed. Notica is a simple but stylish App with a cleverly designed interface that uses image as the focus for the reminder. The notes can be sorted into files for ease of use. SonicPics is a very simple way to gather a few photos together, add an audio commentary and share with others. Comments: Provides an excellent visual prompt to begin a writing activity with visual images or to demonstrate through activity rather than as written text. Book Creator: is an elegant App that is very easy to use. Pages can be created so simply but effectively using image, audio, video or text. The completed project can then look and behave like an eBook when exported and viewed in iBooks. Comment: This is a great App that can be used with all ages. It does not have its own support options but the speech to text option on the device and Speak selection can be used (see above) within the App and when the book is exported to iBooks. If the writer prefers to type text but requires more support, then use a work flow approach and create this in another App offering grids or word prediction. The text can then be simply pasted back to Book Creator. There is one small disappointing detail in that the Title page does not stand out alone in iBooks, but appears as the right page. Pictello: an App to create talking picture albums and books. Each page can contain an image, five lines of text and a recording or use text to speech. Comment: A very easy app to quickly create texts and events to share. N.B. Text is not highlighted and UK text to speech voices need to be downloaded if required but at no additional cost. These take a while to download and you are advised to connect the device to mains power whilst doing so. KeyNote: create your own interactive presentations that can be synchronised across devices automatically with iCloud. Comment: Be aware that if the presentation is originally created on the full version of Keynote (i.e. created on laptop or computer) and then exported, it is not always true to the original. Haiku Deck: an elegant and effective app for the creation of presentations – stunning results but still simple to use. It is so very easy to quickly use up memory on devices with the many Apps around for children, that it is worth giving some thought to what sorts of activities are required and how they can be organised. Do you need to sort Apps into folders or would it best to keep the most frequently used on the first page, for instance? Make full use of the options now available in these devices with text to speech support (TTS) and multisensory activities, e.g. listen to books with TTS, make use of the camera, audio and video options and combine with Apps to produce a personal working environment. As a writing activity, for example, use the camera to record video or take photos for visual prompts, plan writing in Simple Mind+, Skitch or Popplet but use the TTS options in Clarospeak or iReadWrite or any of the Clicker Apps for writing support, then transfer text and images into Book Creator. Apps for tablet devices can be really useful, but they may not always suit every part of the working process for all users, particularly those who struggle significantly with reading and writing text. Tablets and smartphones offer many options for planning, brainstorming and recording but the compensation offered from software on a desktop or laptop may provide greater support for the writing process for some children (and adults). In addition, not everyone finds an onscreen keyboard comfortable to use if they have extended pieces of writing to compose. Mobile keyboards may provide an alternative. Ensure that consideration is given to individual needs and an appropriate tool is selected for each specific task. This may mean that the mobile device is used for only part of the process rather than the whole. Documents can be stored in Dropbox or GoogleDocs and then downloaded to whatever device or computer is used next. PuppetPals HD create puppets, simple animation and voice narration with this screen version of a puppet theatre. Hairy Letters is an engaging animated activity which teaches letter sounds, formation of letters and blending. Playschool Art Maker provides an animated picture and movie maker using PlaySchool favourites. Comic Life lets you create your own comic and share. Toca Tea Party is just one of the quality appealing interactive Apps from this developer. See Tocaboca web for full range. Pirate Scribblebeard’s Treasure for fun making treasure activities. LEGO DUPLO Zoo and other LEGO DUPLO Apps. Busy Things for stories from Dog and Cat, e.g. Three Little Pigs, The Gingerbread Man and others. The Going to Bed Book. Sir Charlie Stinky Socks and the Really BIG Adventure. In addition take a look at the growing library of books from Nosy Crow (e.g. Cinderella, Jack and the Beanstalk, The Three Little Pigs) and Me Books (e.g. Dirty Bertie, Not Now Bernard). Fusion Calculator: A calculator that allows the user to view calculations in multi steps. Numbers can be saved and dragged around the screen whilst the keypad is used for other calculations. Comment: N.B. The free version displays adverts. Neither has scientific functions. Calcbot Another basic calculator that records the previous results in a notepad alongside the keyboard so that you can go over the steps carried out. N.B. Does not have scientific functions. Exam Buddy (£1.99 – iPad) Flexible tool with five applications to support, organise and plan revision. Create your own notes with video and image, prompt cards, quizzes and audio. Freeware Resources contains other useful apps to specifically support study. iPad apps and integrative workflows from Craig Mill at CALL Scotland offers an example of working between Apps. Inclusive Technology have a range of apps for younger users. Nessy has developed apps related to their literacy scheme and programs. Apps for Literacy and Students Struggling with Literacy from Spectronics offer a range of useful literacy support ideas. Dyslexia: Supporting Students: iBook by Jeanette Davies with useful information including video demonstrations detailing how to set up specific features on iPads etc. B.D.A. New Technologies Committee. July 2015. A recent study published in PNAS (Proceedings of the National Academy of Science of Amercia) showed that increasing letter spacing helps children with dyslexia to read more efficiently. To allow people to apply this research finding to their own real life situation, the researchers have introduced a free iPhone and iPad app called DYS. The interactive application allows people to experiment with the spacing between letters to find the one that most enhances their reading performance, compared to standard spacing. The app allows users, if they choose, to share their findings anonymously with the researchers. you think you’re blog for? you create blogging look easy. The overall look of your respective site is fantastic, not to mention the information material!